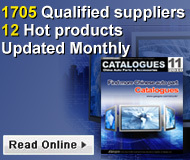 Find 7465 Suppliers for " Electricity & Electronics"
ZiBo YuMing AutoMobile Spare Parts Co., Ltd. Description: We are professional manfaturer of truck tractor car auto switch for VOLVO,BENZ,RENAULT DAF etc with great quality and competitive. Troy Enterprise Co. , Ltd.
Ruian Tianrui Commutator Co. , Ltd.
Shenzhen Jinjitong Technology Co. , Ltd.
Shenzhen Bi Tian Lan Environmental Protection Technology Co. , Ltd. .